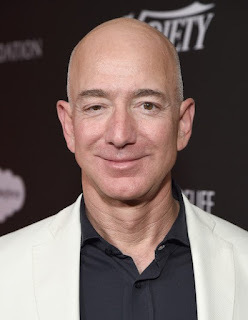 Amazon CEO Jeff Bezos and world’s richest man, on Thursday accused the publisher of the National Enquirer of blackmail after it threatened to publish intimate photographs sent by the billionaire to his mistress if he did not cease his investigation into how the newspaper got the pictures. It comes after the tabloid, having accessed private text messages, last month reported Bezos had an extramarital affair with former news anchor and entertainment reporter Lauren Sanchez — a leak that led to his divorce. In a post on blogging platform Medium Thursday, Bezos said Enquirer publisher American Media Inc (AMI), led by David Pecker, approached him with a threat to publish the photos if he did not halt an investigation into the motives behind the leak. And in his Medium post, Bezos, who also owns The Washington Post, pointed to AMI and David Pecker’s previous cooperation with Trump — including payments made to suppress negative stories, currently under investigation by federal prosecutors. One involves a woman who said she had an affair with Trump. The hush money payment, and a similar one to another woman, was made on the eve of the 2016 election that Trump won. Trump is suspected of campaign finance violations because of the disbursements on grounds they were made to affect the outcome of the vote and should therefore have been reported to government campaign monitors. He added: “Rather than capitulate to extortion and blackmail, I’ve decided to publish exactly what they sent me, despite the personal cost and embarrassment they threaten,” Bezos wrote in the post, which was entitled “No thank you, Mr. Pecker” and included copies of emails from AMI. “Of course I don’t want personal photos published, but I also won’t participate in their well-known practice of blackmail, political favours, political attacks, and corruption. I prefer to stand up, roll this log over, and see what crawls out,” he added.